The Techno-Art Park: Now, your windows super faster ! Now, your windows super faster ! This tutorial is meant for increasing the performance of Windows XP, either it can be a fresh installed windows or an old windows. a.) 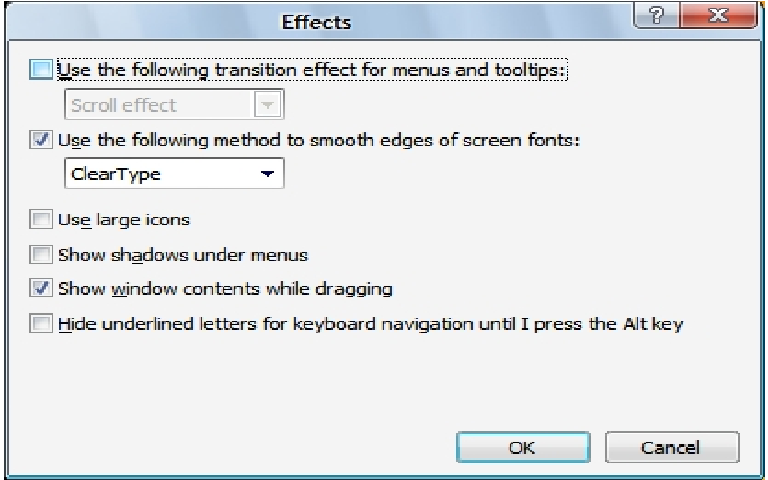 Use the following transition effect for menus & tooltips. b.) Show shadows under menus. d.) Use the following method to smooth edges of screen fonts. You may select “Standard” for this. I hv selected “Clear Type” coz I hv a TFT, it doesnt work properly for CRT monitors. a.) Show window contents while dragging. b.) Smooth edges of screen fonts. a.) Automatically search for network folders & printers. b.) Display file size information in folder tips. c.) Display simple folder view in Explorer’s Folders list. e.) Show pop-up description for folder and desktop icons. f.) Use simple file sharing. Other remaining options are totally based upon user’s requirements, they usually don’t affect the performance! So u can enable/disable them acc. to ur requirements. 6.) Start -> Run and type msconfig, now goto Startup tab and uncheck the entries, which u don’t want to start automatically with the windows, like u can get display settings utility entry there, and many more. 7.) Open Sound & Audio Devices in Control Panel (or typemmsys.cpl in RUN), goto Sounds tab and select No Sounds in Sound Scheme section. Or u can remain some of ur favorite sounds there but set Exit Windows, Start Windows, Windows Logoff, Windows Logon to (None). 8.) For more options/tips-n-tricks for better performance, u can useTweakUI, Tuneup Utilities 2006 and gpedit.msc (Windows XP Professional built-in tool)!